My cousins are driving down from Conesus NY tomorrow for lunch; we’re having Spicy Beef Chili and garlic bread with triple chocolate and pumpkin biscotti for dessert. They make a round trip in one day, five hours each way! Yes, they’re a little nuts but Linda and Cyndi love road trips and Linda’s husband Dave is a good sport and comes along too. The reason for the short visit is they live on a farm. 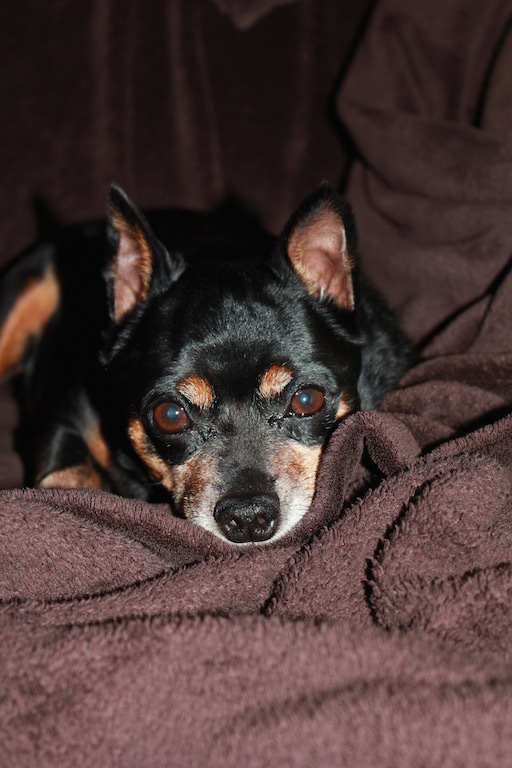 Not a food farm, a horse farm, and the animals need them back in time for dinner. The farm has been in the family since I was a little kid. I remember spending many weekends there and learning how to groom the horses and muck a stall. I’m glad my little rascal Lacy is not as labor intensive! I hadn’t given the menu much thought. Lunch is somehow much easier than a dinner party; there were no to do lists or even a grocery list. 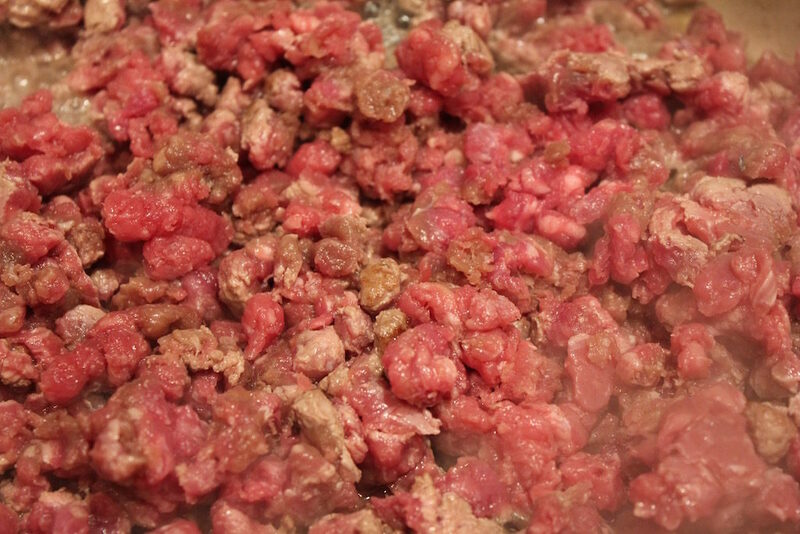 When I got to the meat counter they had some coarsely ground Black Angus beef for chili and that was my inspiration. I picked up some bell peppers, a jalapeño, a head of garlic, canned fire-roasted diced tomatoes and kidney beans. I didn’t give much thought to the garnishes until later and Eric will pick those up tomorrow am and get a baguette for the garlic bread. 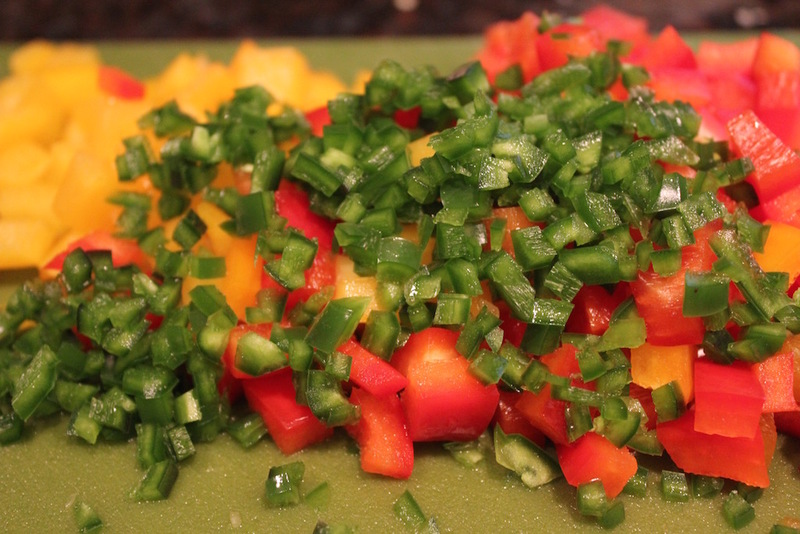 A good rule to remember when chopping vegetables is to look at the size of the ingredients in the recipe. In this case, the kidney beans. 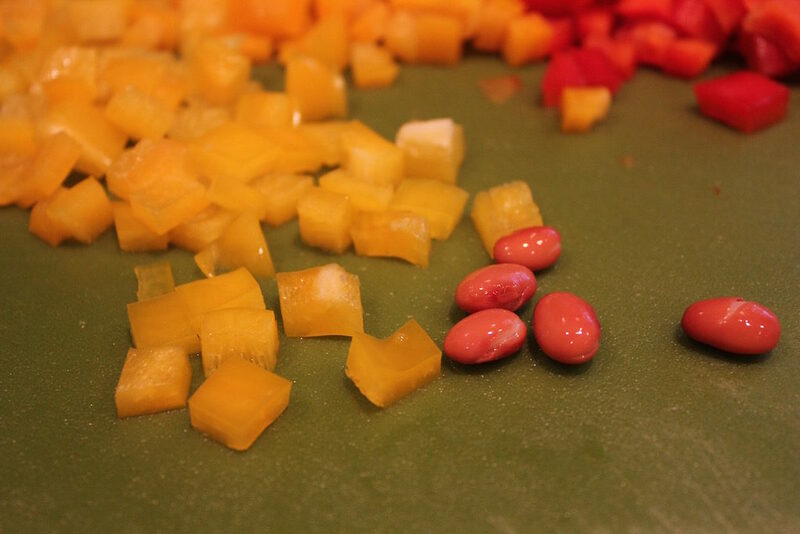 Cut the bell peppers into a dice similar in size to the beans. 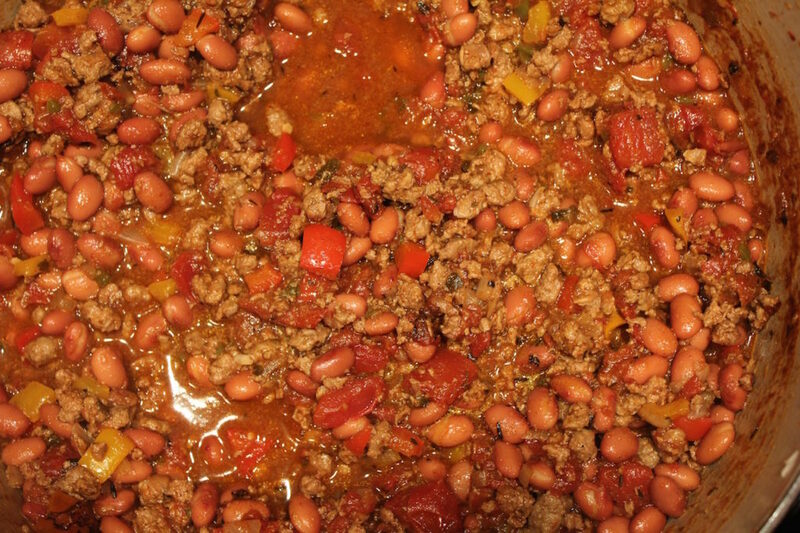 This allows a nice combination of ground meat, peppers, bean and tomato to get on a spoon and you enjoy all the flavors together in one mouthful. The jalapeño, however, should be minced. The smaller the cut the more cells that are exposed and more flavor transfers to the chili. Also, you don’t want to be the one to get a large piece, especially if it’s particularly hot! 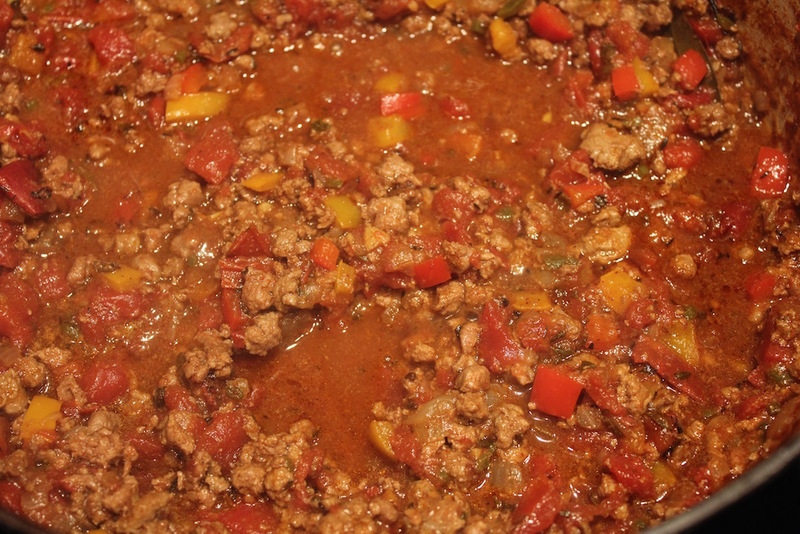 Ground beef cooks up quickly, no long braising needed, and this chili comes together in about an hour and a half. Start by browning the meat on high in a couple tablespoons of olive oil and break it up into crumbles with the edge of a wooden spoon. Add the onions and cook five minutes. Add the chopped peppers, jalapeño, garlic, and the spices. Stir into the meat; the fat and heat release the essential oils of the all those delicious spices more effectively that liquid. Cook and stir occasionally for five minutes. Stir in the tomatoes and stock and simmer for 45 minutes. Add the drained beans and cook until heated through, about five minutes. Put out bowls of sour cream, shredded cheese and thinly sliced scallions to top off the chili. It’s a delicious fall lunch that hopefully will keep them full for their long trek home along with some baggies of biscotti for snacking. Ground beef cooks up quickly, no long braising needed, and this chili comes together in about an hour and a half. 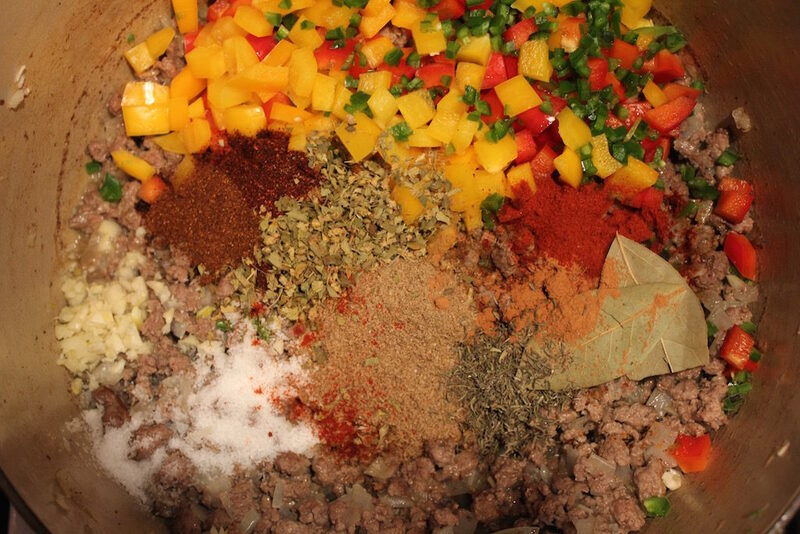 Adding the spices into the meat and vegetables allows the spices to bloom in the fat before adding the liquids. 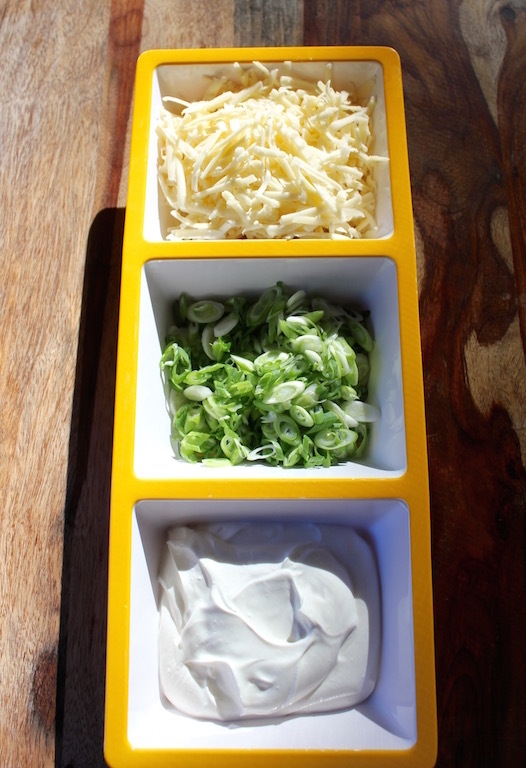 sour cream, shredded Cheddar or Monterrey Jack cheese, thinly sliced scallions. Heat the olive oil in a 7-quart Dutch oven or large heavy-bottomed pot over high heat. Add the beef and brown while crumbling the meat with the edge of a wooden spoon. Stir in the bell peppers, jalapeño, garlic, ancho chili, coriander, cumin, oregano, salt, chipotle, cinnamon, paprika, thyme and bay leaves and cook on medium-high for five minutes. Add the beans and continue cooking another 5 minutes, until the beans are hot.